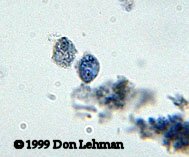 The Trichomonas sp. do not have a cyst stage. The trophozoite of T. hominis has a pyriform shape and has an axostyle, and four anterior flagella. There is an undulating membrane that runs the entire length of the body. The trophozoite measures from 5 to 15 µm in length and from 7 to 10 µm in width.